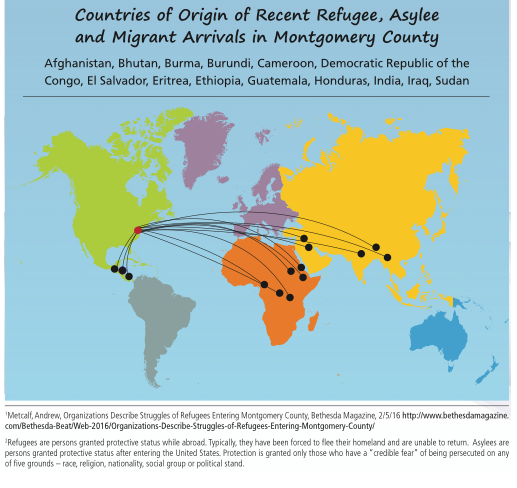 Refugees receive support the first few months after their arrival through federally-funded resettlement programs that are implemented by nonprofit resettlement agencies. These agencies supplement the Federal program through private funding. Families need to settle into a new residence, learn to take public transportation, go to numerous medical appointments, enroll their children in school, learn or improve their English and immediately find a job. They face cultural and language barriers. Many are suffering from PTSD and other illnesses. Many are seniors for whom the transition is particularly difficult. After a few months, they must be self-sufficient and pay their own rent. They are often new to the community and may not have a safe place to live. They are ineligible for public benefits and it can take up to a year for them to receive a work permit. Once granted asylum, these new residents need assistance finding better jobs, to be re-certified in their career field and to improve their English. They also suffer from PTSD and other illnesses. Central Americans Fleeing Violence In 2014, a Central American migration crisis emerged when tens of thousands of women and unaccompanied children from Central America journeyed to the United States seeking asylum due to unprecedented levels of crime and violence in their countries. From 2014-2015, over 2000 minor children were welcomed to Maryland, more per capita than any other state. The status of Central American minors is similar to that of an asylum seeker in that they are applying to stay in the U.S. because of the dangers of going home. From the inception of the Syrian refugee crisis, faith communities in the U.S. have been ready to help. Syrians families began arriving in the DC area over the summer. Resettlement agencies expects that up to 200 Syrian families will be resettled in the DC area in 2016 and more in 2017.